Baden-Württemberg is one of the 16 states of Germany. Baden-Württemberg is in the southwestern part of the country to the east of the Upper Rhine, bordering Alsace (France) to the west, Switzerland to the south, Bavaria to the east and northeast, Hesse to the north, and Rhineland Palatinate to the northwest. Most of the major cities of Baden-Württemberg straddle the banks of the Neckar River, which runs downstream (from southwest to the centre, then northwest) through the state first past Tübingen, then Stuttgart, Heilbronn, Heidelberg, and Mannheim). Baden-Württemberg is the third largest in both area and population of Germany's sixteen states, with an area of 35,742 square kilometers (13,800.1 sq mi) and 10.7 million inhabitants (both almost equivalent to all of Belgium) making it the third largest. 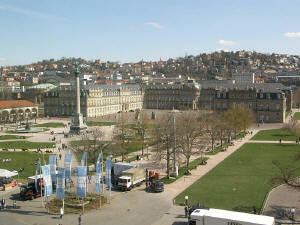 The state capital is Stuttgart. 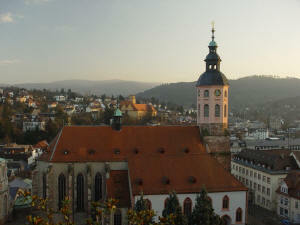 Baden-Württemberg, in sunny southwestern Germany, is the third-largest of all German states. Our proximity to our western neighbor France, as well as to our southern neighbors Switzerland and Austria, has added unique and fascinating aspects to our culture and traditions over the centuries. Those who come to us will discover the best of everything. The Black Forest ( Schwarzwald) is a wooded mountain range in Baden-Württemberg, southwestern Germany. It is bordered by the Rhine valley to the west and south. The highest peak is the Feldberg with an elevation of 1,493 meters (4,898 ft). The region is almost rectangular with a length of 200 km (120 mi) and breadth of 60 km (37 mi). Hence it has an area of approximately 12,000 km2 (4,600 sq mi). The name Schwarzwald, i.e. 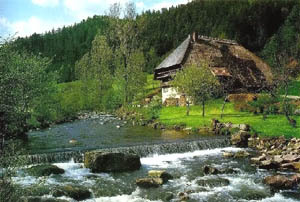 Black Forest, goes back to the Romans who referred to the thickly forested mountains there as Silva Nigra , i.e. "Black Forest," because the dense growth of conifers in the forest blocked out most of the light inside the forest. With its mild temperatures, there is a profusion of vineyards and lifestyle is relaxed and serene beckoning the tourist to visit. In this region you will find the romantic cities and be impressed with the wild gorges, valleys, rivers and lakes you will discover in the Black Forest. Along the banks of the Upper Rhine you will be enchanted by the medieval castle and ruins. The Black Forest runs along a stretch of the River Rhine, which is navigable from Basle to Rotterdam. It also contains the source of the River Neckar and the Danube. In addition, Lake Constance, Switzerland and the Alsace region of France all border directly on the Black Forest. Stuttgart, the capital of Baden Württemberg, has much to offer with a reputation of famous ballet, outstanding cultural and sports events and many interesting sights. In 1320 the Alte Schloss or Old Castle was built with special surrounding moat. With an amazingly beautiful courtyard which holds distinction of one of the most beautiful in Germany. Wonderful paintings from the Middle Ages up to the 20th century can be viewed at Stuttgart's Old and New State Gallery. This is one of Germany's most visited galleries. Mostly we attribute Stuttgart's fame as the city of the automobile. Gottlieb Daimler and Karl Benz built first motor vehicle 100 years ago and founded the first automobile factory in 1926. Today visitors from around the world enjoy touring the Mercedes-Benz Museum. Stuttgart is also home of the Porsche sports car. 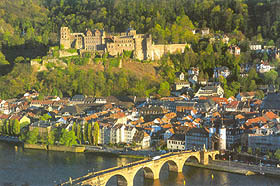 Heidelberg, a gem of a city, is along the Castle Road. The Heidelberg Castle, majestically perched above the city, dominates the outline of this picturesque place. Lanes of cobblestone lead the tourist to town squares, open markets with interesting wares and unique shops. The Neckar River cruise is most assuredly a way to enjoy the beauty in most relaxed manner. 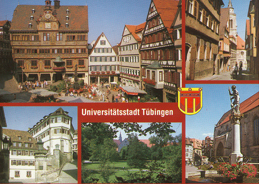 Tübingen is best known for the centuries -old university with approximately 20,000 students in a city with population of 80,000. This city of learning offers a little of the past as well as modern day activities. Half-timbered houses give a warm feeling and wine taverns, student pubs and small shops encourage the visit or to stay awhile and rest. The boats on the Neckar River give a restful scene and romantic inns suggest memories of great poets and thinkers of a bygone era. Cultural and intellectual life dwell here and annual musical events offer folk music, rock and classical. This state lies in the sun drenched southwest of Germany offering visitors the very best of climatic health resorts, famous mineral- thermal treatments at numerous accommodating spas. Besides the wellness features of this region, Baden-Baden is famous for beautifully laid out extensive park system, tree lined avenues, and a distinctive architectural flair to this special locale. Festive evenings in the world's most lavish casino, according to famous Marlene Dietrich and attending outstanding events in the Festpielhaus, Europe's second largest opera and concert house will surely incite any tourist's interest. The Baden wines are famous as is the fine cuisine offered in this state. Numerous parks supply walkways to stroll leisurely and golf courses invite avid players. Also available are tennis, horseback riding, mountain biking, and hiking. This is an exceptional area to enjoy the outdoor pleasures. Against the backdrop of the alpine chain, Lake Constance, dotted with countless white and coloured sails in the summer, exudes a cheerful mediterranean atmosphere. There are also a number of charming tourist attractions along the shores of the lake itself. On a visit to Lake Constance, for example, you can take an excursion to Meersburg Castle, enjoy a stroll along the lakeside promenade, visit the Zeppelin museum in Friedrichshafen or the pre-historic lake village built on piles in Unteruhldingen. One of areas wonderful attractions is Lake Constance and Inzel Mainau and holds many memories for wife and me. I have prepared a great slide show of the area for your enjoyment. Mainau Island: the popular "island of flowers" between Meersburg and Constance is a real pleasure at any time of year. The Butterfly House, the Palm House and the temporary exhibitions held here mean the island is always a popular choice for an excursion, both for keen horticulturalists and the casual day-tripper. Mainau has been one of our favorite places to visit. We have visited Mainau in both spring and summer giving us the opportunity to see the seasonal changes...the tulips of spring and the roses of summer. I have taken hundreds of photos and would like to share just some of them with you.